Hike the Seven Lakes Basin Loop in the autumn season. We would do this adventure as a 5 day backpacking trip. We had the goal of photography and backcountry fishing. The timing has to be right for a pleasurable experience. The High Divide is a trail loop that is primarily above the Sol Duc River valley. It is an 18.5 mile loop that starts at the Sol Duc Falls Trailhead. Some may chose it in several days of camping, but most just do it in one night. Some strong hikers even day hike the loop in a day. Don't forget that this area requires you to have a reservation permit and a bear canister. After climbing out of the Sol Duc valley and into the mountains. This trail gives you superb views of Mount Olympus and the Bailey Range. Interested in learning more? 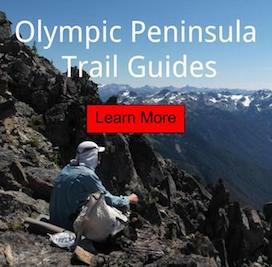 Complete trail guide to the Olympic Peninsula. Winter is on its way... I wanted one last high country route to hike before the snow started falling in the Olympic Mountains. I saw patch of clear days in the weather report and decided to make my way up the Sol Duc. Seven Lakes Basin trail in fall provides breathtaking alpine views, vibrant autumn colors, plenty of opportunities to see wildlife, and more solitude on this popular summer loop. Plus we got to chomp on the last of the berries for the season. Disclaimer: This exact route should not be attempted without map reading and basic mountaineering skills. Article contains ads in the form of affiliate links. Day 2 - we adventured off for day hiking without our packs. Pretty early on we ran across this guy munching on some low bush blueberries. Seeing black bears in the wild is always awe-inspiring. It might have been the perfect timing of the season and the right spot, but this was the most amount of mushrooms I've ever seen on the trip! Water resupply with my Sawyer Squeeze! Fishing at Lunch Lake. For backpacking I always love bringing a lightweight Tenkara Rod. This was a whole different kind of trip, compared to the previous hike. Where we spend 10 days backpacking across Park. The autumn colors and animal activity, made this adventure really special.